A Christian neighborhood and a court complex in Pakistan was shaken by twin suicide bombings on Friday, which left at least 14 people dead and more than 50 injured. (Reuters/Khuram Parvez) Men gather under a ceiling with bloodstains, after a twin bomb attack occurred at a court, in Mardan, Pakistan, September 2, 2016. 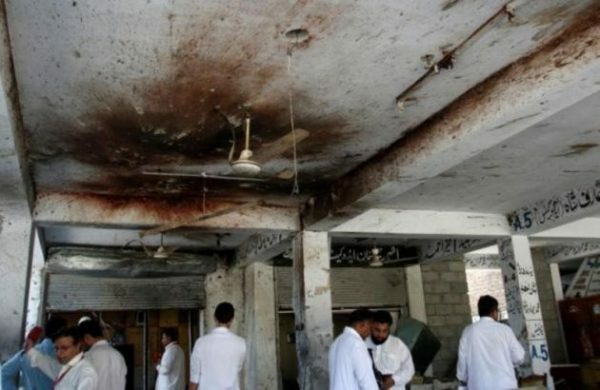 In the city of Mardan in the province of Khyber Pakhtunkhwa, a member of the militant group Jamaat-ul-Ahrar hurled a grenade at the gates of a court complex before blowing himself up, according to senior police superintendent Shafiullah Khan. District police officer Faisal Shahzad also told CNN that the attack launched by the Pakistani Taliban’s splinter group left at least 13 people dead and 53 injured. Mardan Bar Association president Amir Hussain said four of the fatalities were lawyers. He also added that the courts will be closed for three days set for mourning. Earlier that day, suicide bombers also targeted a Christian neighborhood on the outskirts of Peshawar, killing one bystander and injuring three members of the country’s security forces. Peshawar police superintendent Kashif Zulfiqar told CNN that the attackers were able to enter the neighborhood after they attacked a security guard that morning. In an emailed statement, Jamaat-ul-Ahrar claimed responsibility for the twin bombings, which targeted Christians and lawyers. “If Islamic law is not imposed across the country, such attacks will continue to be carried out,” the terror group said in a statement. Jamaat-ur-Ahrar spokesman Ehsanullah Ehsan also sent a statement to Reuters vowing to launch more attacks. He instructed civilians to stay away from “un-Islamic courts” and other law enforcement establishments because these places will be their next targets. Meanwhile, Prime Minister Nawaz said the twin bombings would not break the country’s “unflinching resolve” in their fight against terrorism. “These receding elements are showing frustration by attacking our soft targets. They shall not get space to hide in Pakistan,” said Sharif in a statement. In March last year, a suicide bombing in Lahore left at least 14 people dead. In 2013, more than 80 were killed when suicide bombers attacked a church in Peshawar.